Did you know that Chicago’s Edgewater community is more than high-rise condo buildings along the lakefront and 2 or 3 flat homes in Andersonville? 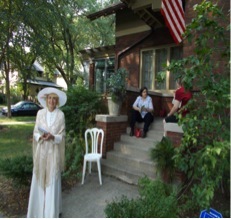 As a Chicago realtor since 2002, I was surprised to discover the quiet, tree-lined Edgewater Highlands neighborhood, where I felt like I was stepping back in time to the late 1800’s. This neighborhood proves you can have a peaceful home, yet still enjoy all the benefits of city living: great transportation, wonderful local shops and restaurants, and a short bike ride to lakefront running paths and beaches. My husband and I spent a very pleasant Sunday afternoon on a walking tour of homes in the neighborhood, which dates back to 1885. I was surprised to discover this haven of lovely historic homes, mainly located in the area bounded by Hermitage, Paulina, Devon and Granville. The neighborhood was originally developed by John Cochran, and the views from the homes’ second stories were beautiful. Edgewater Highlands adjoins the other small neighborhoods of Edgewater Glen and Magnolia Glen, but the Edgewater community as a whole encompasses a number of other Chicago neighborhoods, including Andersonville. We started our tour at 6345 N. Hermitage Street- on the northeast corner of Hermitage and Highland- an American Craftsman bungalow designed in 1914 by architects Hatsfeld and Knox. Hatsfeld started out as a draftsman for the board of education, and also designed some lovely park district buildings, such as Indian Boundary and Green Briar Parks’ field houses. 6345 N. Hermitage’s original owner was a Swedish immigrant who bought it for $6,000, and was owned by the Rozek family from 1935 through the 1990’s. It still has most of its original woodwork, stained glass and pocket doors. My favorite feature is the screened porch, and believe it or not, the new garage was built by the current owner from plans ordered over the internet! 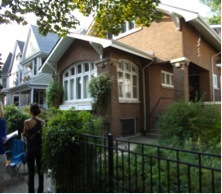 Our next home on the tour, 6337 N Hermitage, is on the National Register of Historic Places. I was surprised to learn that it was also designed by Hatsfeld for the Rozek family. With a stucco, Queen Anne- style exterior and a broad open porch, 6337 had completely different feel than the other Hatsfeld home nearby. My favorite features here were the lovely new kitchen that seamlessly blends with the home’s original historic details, and the upstairs balcony that overlooks the lovely gardens and neighborhood rooftops. I love both older homes and gardening, so seeing these gorgeous homes and yards, as well as hearing their unique stories, was a great Sunday treat!